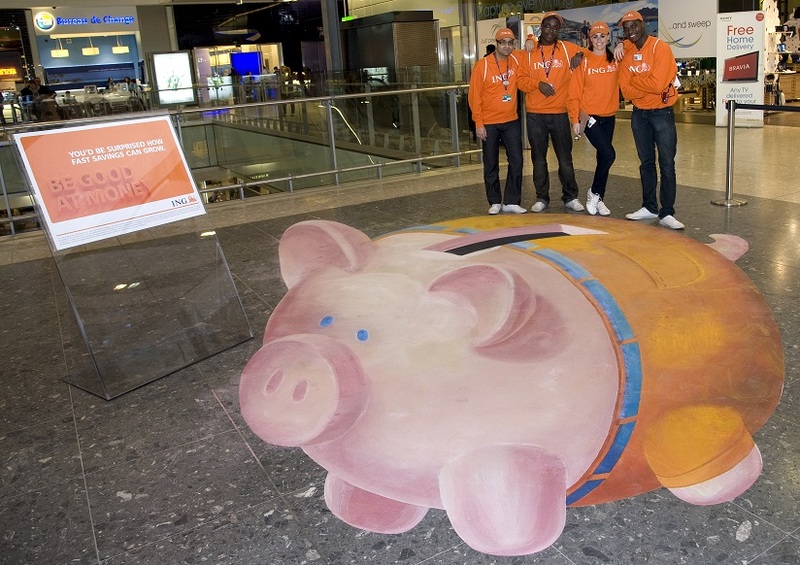 Hire Brand Ambassadors for events London UK – Love Creative Marketing agency were approached by ING to implement an exciting ground-breaking ambient promo marketing campaign. A selected team of motivated Brand Ambassadors from our database were chosen to manage the promotional campaign across 8 countries. Our Brand Ambassadors encouraged members of the target audience to consider their relationship with finance using product specific messages to achieve set objectives. In each market the product focus varied, and as a result, four different “Be Good At Money” 3D chalk art executions. A playground installation were to be used to communicate the key messages across the markets. A dedicated micro-site which Brand Ambassadors drove audiences to Facebook page was set up for a competition. Our Brand Ambassadors took photographs of consumers posing on the 3D chalk art, which were later uploaded and given away as instant prints in real time for a memento. A competition simultaneously ran, enabling consumers to vote for their favourite pictures, and the photo with the most votes in each individual market place won an iPad. Pop-up banners, flyers and Promo Staff communication reinforced these Be Good At Money messages, and drove participation in the contest. Based in various malls and airports in the different countries, the plan to implement 3D chalk art ads and playground installations were developed into a strategic experience which drove in-depth engagement and word of mouth due to the fun element of the execution, as well as generating data and significant content for digital and social media amplification. Eight individual markets were exposed to the campaign, UK, Honk Kong, Japan, Chile, Mexico, Romania, Spain, and India. Post campaign, ING is still continuing to reach more and more people through the digital amplification of the ambient activity, reinforcing the ‘Be Good At Money’ message. We have a huge database of wet trained Brand Ambassadors across the globe who are ready to assist with your next promotion.